Hello there. The purpose of this blog is to share my birdwatching experiences with anyone who is interested. I'll post backyard sightings, sightings at local parks like PennyPack Ecological Restoration Trust and Carpenter's Woods, and regional "hot spots" such as Cape May NJ and Hawk Mountain PA. Occassionally, I'll post sightings and trip notes from our big birding trips. Connie and I have been actively birding for 15 years. Our interest has grown from looking at birds occasionally to planning full vacations around migration routes and times. That's why we call ourselves "Bird Nerds". My sister and her partner got caught up in this with us a few years ago and now they get dragged along with us. And then there are our friends from the ice hockey team who got totally hooked recently. I'm the most obsessed one in the group although Lori is gaining on me rapidly. Anyway, I'll try to keep it fun and light. Take tomorrow for instance. We are planning a quick trip to Forsythe NWR in Brigantine NJ to see geese and ducks. The weather is calling for rain and thunderstorms and wind. No sun. We're going anyway because Lori just bought a new SUV and has never been to Forsythe. So, we're going. I'll let you know if we see anything. The Osprey photo was taken last month at Cape May Hawk Watch. That was a great day for us. We saw a ton of Osprey. Mostly with fish for some reason. My sister started making snide comments like "Why don't they just call out the ones without fish for a change". That's just a ridiculous amount of Ospreys to see in one day. 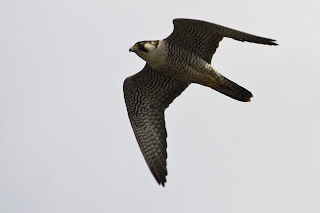 I never thought that I would see that many Peregrine Falcons in my lifetime let alone in one day. Our little group probably saw 40 Peregrines flying low, high, fast, slow. Wow.